No new contract for Robin van Persie. “I personally have had a great season but my goal has been to win trophies with the team and to bring the club back to its glory days. “Out of my huge respect for Mr Wenger, the players and the fans I don’t want to go into any details, but unfortunately in this meeting it has again become clear to me that we in many aspects disagree on the way Arsenal FC should move forward. “As soon as Mr Gazidis is back from his two-week holiday in America further meetings will follow and I will update you if and when there are more developments. I can’t say I’m all that surprised, but I am disappointed. I’m not furious; I won’t be stooping to the lows of some and filling his Twitter account with hateful bile and declarations of intent to cause harm. That’s plain idiotic. However, I’d be lying if I said there wasn’t just a little part of me that’s annoyed. He only gave us one truly exceptional season, and that came after infinite patience was shown to him by the club. I know deep down that Robin owes nothing to anyone, and that loyalty in modern football is a fallacy, but I can’t shake off being a touch aggrieved. That said, now isn’t the time to mope and moan. If he’s made up his mind, then we should do the same. Slap a price on him, and offer him to the big guns around Europe. Get it done quickly, so we can use the incoming funds to bring in a couple of quality players. DO NOT under any circumstances sell him to Manchester City. I’ve had more than enough of those irksome moneybags’ pilfering our players, and selling him to a rival is just plain stupid. Given the part where he mentions the club’s ambition, and how it doesn’t match his own; I don’t think keeping him another year is a good move either. I think we have no choice but to let him go. And if that’s the cards we’re dealt, so be it. Arsenal are a club – we are not one player. No one could deny his contribution, or the fact he is an exceptional player. I wouldn’t think to cast aspersion over a footballer I admire simply because he hasn’t done what I want. I thank Robin for all his brilliance last season – as both a captain and a striker. But, I also now wish him to leave. Things change, people come and go and the thing that remains is us; the fans. We survived the loss of Henry, Vieira and Pires. 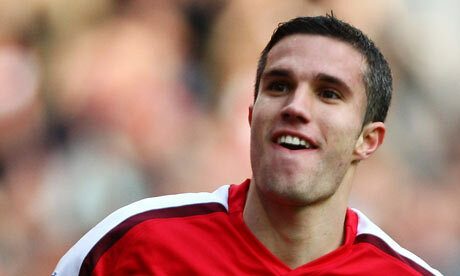 We’ll certainly survive Robin van Persie. The next few weeks could get very interesting indeed. Let’s hope Arsene has planned for this. Thanks for reading today (again), you lovely people. The comments are below. What do you think about the news? How have you taken his decision? Let me know – I look forward to reading a few. Official Podolski, Bruce’s Mannone love, M’Vila and other news. Sell him? Replace him? Keep him against his will? Damn you, Robin van Persie. Sell to Juve or another club outside the Pl for as much as poss ASAP. Hopefully put all money back in to new signings. It’s been reinvested already into 2 other forwards. Wenger and the Board knew weeks ago but RVP agreed to keep quiet while we bought replacements. Wenger’s protests that he would ” hang on to RVP at all costs ” was to try to avoid some of the flack. RVP and Cesc and Nasri and Clichy have all left … yes for more money but also … because they have long since given up on the Wenger grand plan for beautiful, attacking football with no tactics and no adeqaute defensive option. ” let the other teams worry about us ” I am sure you remember. Wenger told him he couldn’t stop Vermaelen from leaving and no decent, available defenders want to tarnish their cv’s in Arsenals slapdash back line! TV5 for the armband now. Well, sad news that is. One point to clarify: are you 100% sure transfer money gained in this transfer window can be furnished directly into incoming transfers? From what I know of how clubs operate, transfer revenue is hardly ever paid in full on the day the contract is signed, and is usually paid in installments in a longer period of time. Then, there’s the question of Arsenal not being a one-man club, which means that the decision to raise more transfer money has to be made by the governing body, not by any single person (Wenger included). In other words, while a transfer is economically the most viable option, it wouldn’t affect Arsenal’s transfer window per se. The club’s just issued an official statement in which they reiterate their firm RVP stance: they believe he’ll be staying at Arsenal until his contract is due. Is that possible? Of course it is. The worst case scenario is RVP is going to begin the season at Arsenal and then move in January – but with him being cup-tied, who would have him then? So, it’s not impossible for him to remain at the club until the end of the season, and maybe then rethink his approach. By that time he would be free to decide where to go. I’m only thinking aloud, but sometimes I’d really like to see Arsenal rejecting a transfer plea, even if it would only spell financial losses. As for RVP’s decision, his statement shows he’s become quite estranged from the club’s dealings. Apparently, he doesn’t know that the club has spent in excess of 20 million pounds on two experienced, but still young strikers. His statement suggests it’s really not about the trophies or the Arsenal strategy. Pity. If City will pay more than 30 million, I think it might still be a good idea to sell him there. Unless the club’s strategy is to show him what he’s missing this season in the hope he’ll rethink his position. I couldn’t be %100 sure of what Arsenal would do with any potential income. Truth be told; I’m speculating on what I’d like them to do. If he goes – which I’m certain he will – we need to act. Giroud and Podolski are a good start, but another attacker wouldn’t go amiss. Well if hes going its better to know now than in 6 weeks time . At least now we can move on and sell him and get some players in before the start of the season, I think we may lose Walcott as well, I’m not sure how i feel about that. This is definitely going to be busy and interesting transfer window, so many players to sell and hopefully bring in some good ones. I feel a bit for Wenger in all this, he brings all of these players in gives them a chance then they all run off the first chance they get. With RVP he was great last season but hes 29 soon and we have lost better players then him before, so we just have to move on and hope Wenger does some good transfer business. Ha! Goes to show not all surprises are good ones. If wenger is offered up as a sacrificial lamb by the board(should attendances decline), the board will only replace with another ‘yes man’. Keep away from the Emirates until the board resigns in full. Billionaires on the board, working families expected to clear the club’s debts, not sustainable. won’t be repeated. Only hope no idiot will try and persuade him to stay. Next season we will have a stronger side than for many years.